of beautiful resources on E. T. A. Hoffmann. The story of the Nutcracker is unusual in that so many people know it primarily as a ballet, accompanied by Tchaikovsky's excellent music and generally scattered with Christmas cheer. But the ballet is only half the story (quite literally). (In an interesting twist, it is actually based on an adaptation made by Alexandre Dumas -- the author of The Three Musketeers (the usual "if you haven't read it, what are you doing with your life" comment applies).) The original, however, was written by E. T. A. Hoffmann. Hoffmann, incidentally, has a history of inspiring musical people. The most obvious example outside of The Nutcracker is that Offenbach wrote an absolutely brilliant opera based on the Tales of Hoffmann. But returning to the novella at hand: You can read it here (though in English translation; he was inconsiderate enough to write it in German originally). The story opens as Marie and Fritz Stahlbaum are waiting to see what gifts and clockwork toys will be brought them by the baby Jesus and their Godfather Drosselmeier, respectively. Drosselmeier arrives, looking rather sinister. He was short and scrawny, his face was cowered with wrinkles, and he wore a big, black patch instead of a right eye. He also had no hair on his head, which is why he sported a very lovely periwig made of spun glass and very artistic. A bright shine grazed the wall, and now the children knew that the Christ Child had flown away on radiant clouds, flown to other happy children. On a great lawn embellished with colorful flowers stood a fabulous castle with many pate-glass windows and golden turrets. A glockenspiel resounded, doors and windows opened, and you could see very tiny but dainty ladies and gentlemen in plumed hats and with long trains strolling through the chambers. The middle room had so many burning candles in silver chandeliers that it looked as if it were fully ablaze, and children in short vests and jerkins were dancing to the sound of the glockenspiel. A gentleman in an emerald cape often peered through the window, beckoned to the onlookers, and disappeared again -- just as Godfather Drosselmeier himself, but scarcely larger than Papa's thumb, at times stood below, at the castle gates, then stepped back inside. The children, however, dismiss it because they have no use for toys that only repeat the same actions over and over, and which leave no room for variety or their own input. Drosselmeyer is understandably annoyed, considering the marvel that such a clockwork creation is; but he is eventually mollified by praise from the other adults. an excellent little man, who stood there, quiet and modest, as if calmly awaiting his turn. Granted, there was a lot to object to in his stature; for aside from the fact that his somewhat lengthy and powerful upper body didn't quite fit in with the tiny, skinny legs, his head likewise seemed much too big. To a great extent, amends were made by his attractive clothes, which suggested a man of taste and breeding. Fritz kept shoving in the biggest and hardest nuts. All at once they heard a double crack. Then three little teeth fell out of the Nutcracker's mouth, and his whole lower jaw turned loose and wobbly. "Oh, my poor, dear Nutcracker," Marie exclaimed, whisking him out of Fritz's hands. "He's a stupid simpleminded guy!" said Fritz. "He wants to be a Nutcracker, but he has no decent teeth. He probably doesn't understand his own work. Hand him over, Marie! He has to chew up nuts for me, even if he loses his remaining teeth -- even his entire jaw in the bargain. Who cares about that good-for-nothing?" "No! No!" Marie wept. "You're not going to get him -- my dear Nutcracker! Just look at the way he watches me so sorrowfully and shows me his little, injured mouth! But you're a coldhearted person, Fritz -- you beat your horses and you even let a soldier be shot dead!" "Clock, tick, tock, clock, tick, tock! And everyone has to hum softly, hum softly. After all, Mouse King has a fine ear. Soon there will be few!" Marie shuddered dreadfully and she would almost have dashed off in horror if she had not spotted Godfather Drosselmeier, who sat on the wall clock in lieu of the owl, his yellow coattails dangling like wings on both sides. Anyone who has seen Twin Peaks will probably agree with me that seeing your godfather in the place of an owl should NOT be comforting in any way. However, things quickly get worse: The room fills up with mice, who act quite unnaturally, lining up like soldiers. We are told that Marie isn't scared of mice, and so finds it rather funny; until one really creepy mouse with seven heads, all crowned, shows up; and at its signal, the mouse army starts moving towards her (any lawsuits over nightmares should be directed at the estate of E.T.A. Hoffmann, not me). The battalion of elitists, showing Spartan boldness, would have torn victory from the foe, if a daring enemy horse captain had not recklessly plunged forward and bitten off the head of one Chinese emperor, who, in falling, then killed two Tunguses and a long-tailed monkey. The result was a hole through which the enemy pushed in, and soon the entire battalion was chewed up. However, the enemy had little profit from this atrocity. Just as a bloodthirsty mouse cavalierist chewed up a bold opponent straight to the middle, the mouse was given a small printed slip of paper down its throat, from which he promptly died. yelled in utter despair: "A horse, a horse, my kingdom for a horse!" and would have been captured, except Marie throws a shoe at them before falling into the glass cabinet and fainting away. Princess Pirlipat is the most beautiful girl in the world. She has the usual golen hair etc. In addition, Pirlipat brought two rows of small pearly teeth into the world, and two hours later, when the grand chancellor tried to examine her facial lineaments more closely, she bit his finger so hard that he shrieked: "Oh, Jimmy!" Then again, others claim that he yelled, "Owww!" Opinions are sharply divided even today. In any case, she really did bite the chancellor's finger, and now the delighted populace knew that intellect and intelligence dwelt inside Pirlipat's little body, which was as beautiful as that of an angel. "My sons, my relatives have been killed. Be careful, Your Royal Highness, make sure that Mouse Queen doesn't chew the little princess in half -- make sure." Thereupon she vanished again and was seen no more. But the queen was so terrified that she dropped the lung puree into the fire; and so Frau Mouserink spoiled a second royal treat, which infuriated the king. The ploy of cats does not work, of course (the cats fall asleep), and Frau Mouserink turns the child into an ugly creation, very like a Nutcracker. Refusing to see that it is his own fault for making such a fuss about a bit of bacon in sausages, the king declares that unless Drosselmeier manages to solve the problem within four weeks, he will be executed. And Drosselmeier tries very hard. He took Princess Pirlipat apart very adroitly, unscrewed her little hands a feet, and viewed her inner structure. But in the end he despairs. Drosselmeier started weeping bitterly, but the princess delightfully cracked nuts. The shell of the Krakatuk Nut was so hard that a forty-eight-pound cannon could have charged across it without breaking it. But this hard nut had to be chewed up in front of the princess by a man who had never shaved and who had never worn boots. 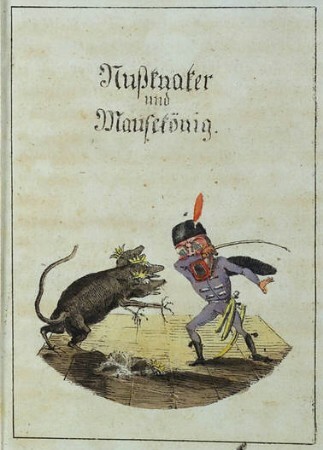 his deformity would vanish only when Frau Mouserink's son ... had become Mouse King. That son would have to be felled by his own hand, and a lady would have to fall in love with him despite his defects. Back in the present, the Mouse King institutes a protection racket, where he threatens to eat the (now swordless) Nutcracker unless Marie gives up first her sweets, then her sweet dolls, then her picture books and her new dress. Eventually she gets her brother to provide a new sword for the Nutcracker, however, and the Mouse King is promptly killed. The Nutcracker, or rather young Drosselmeier, gives Marie the seven crowns, and invites her into his kingdom (made entirely of candy). When they passed through the gates, which looked as if they were built out of macaroons and frosted fruit, silver soldiers presented their rifles, and a manikin in a brocaded robe threw his arms around Nutcracker and said: "Welcome, dearest Prince, welcome to Jamburg!" During the meal, the well-behaved young man cracked nuts for the entire company. Which is really all you can ask for. The story does get a little creepy when they are instantly engaged, and it is suggested that they get married only a year later -- because throughout the story I have thought of Marie as being no more than six. Feel free to enlighten me on that score. It is a lovely story in most other respects (wonderfully snide, and with enough puns (certainly in the English translation) to satisfy even Tor; I might just learn German to read it in the original. Interessant hvordan jeg helt til nå har gått rundt med en slags vag idé om Nøtteknekkeren er en opera, og den handler sikkert om noe typisk opera-aktig, pluss at jeg sånn omtrent kan nynne et lite utdrag av Nøtteknekkersuiten. Og så viser det seg at det egentlig er en temmelig surrealistisk greie, og dessuten en ballett. Jeg skjønner jeg må lese denne. Og høre resten av operaen. 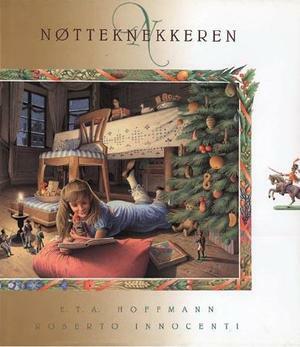 Denne ble litt skummel, kjenner jeg. Jeg sitter med rynke i panna as I speak. Du er klar over at det var en av de første bøkene du eide? Den var veldig fin; jeg var ganske misunnelig. Oi. Det husker jeg vagt, når du sier det!